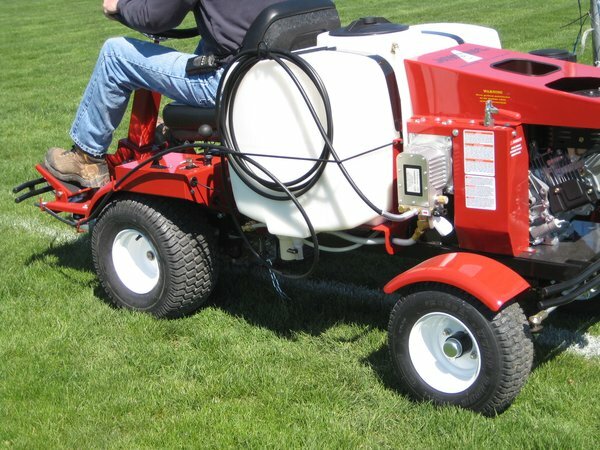 The NewRider 5000 is the first true ride-on airless paint striping machine designed to produce the brightest, straightest lines available on natural or artificial turf. Front wheel drive with rear steer produces straighter lines than comparable front steer machines. The airless pump with adjustable pressure lets you dial in the spray so you spray “just the turf” without wasting paint or injecting the soil or disturbing the rubber filling. 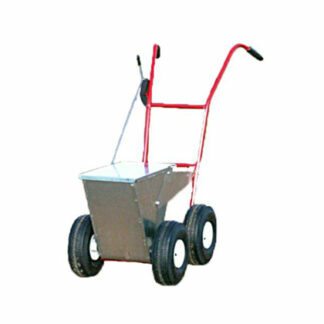 The front swivel caster follows ground contours for consistent line width. Plus, an adjustable tilt steering column and high back seat provide operator comfort and let you enter and exit the machine with ease. Straighter Lines – The NewRider™ 5000 has front wheel drive with rear steering. Placing the spray gun closer to the pivot point of the machine means less movement of the spray gun compared to movement of the steering wheel. The low seat height of just 30” and center spray head allow you to sight down existing lines or easily follow layout strings for the straightest lines possible. 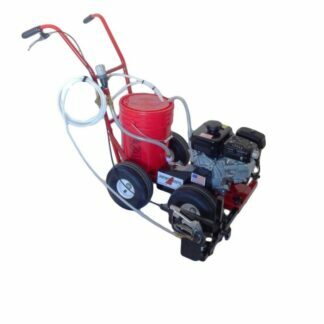 Brighter Lines – Fully adjustable, 0-3000psi pump pressure. You control the perfect pressure to apply thinned or non-thinned paints. You get complete coverage of “just the turf” without injecting or smothering the soil. The result is healthier turf and brighter lines with any paint. 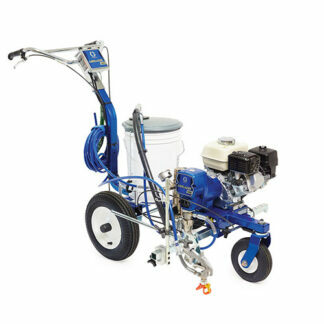 Consistent Line Width – The floating, front swivel caster allows the spray gun to follow ground contours while maintaining the line width for more consistent lines over rough terrain. Ease of Use – The adjustable, tilt steering column allows easy enter and exit of machine. Seat based operator controls for ignition, throttle and parking brake. 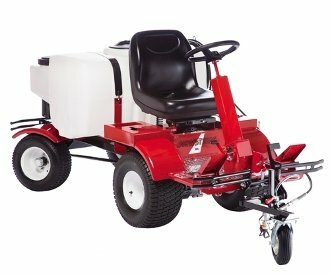 Foot pedals control forward/reverse, speed, spray gun activation, steering column lock and lifting or lowering the spray head. Easy Clean UP –On-board 2.5 gallon purge tank lets you clean spray gun and hose in the field. In-line filter keeps you running without clogs. Versatile – A quick release clamp allows you to remove the spray gun to spray stencils, small curves and hard to reach areas with a 25’ length hose. 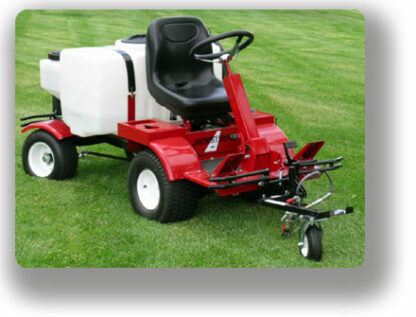 Powerful – Powered by a Honda GX390 engine with electric start powers the hydro-static trans-axle and airless spray pump. Fewer Stops – The 50 gallon poly tank lets you stripe up to four football fields or up to seven full-size soccer fields with one filling. 36 Month Limited Warranty – Every Newstripe machine is covered with our Equipment Protection plan for a full 36 months.